Hello, I just installed Free Pascal on my first-day Stretch and have some problems with finding Pascal folder and the way to execute it. I had no problems with a downloading or installing. Just type fpc and some options on the command line. You don't need to find the file to run it, it just has to be in your PATH. I'm not familiar with FPC on the Pi, but is that the Lazarus IDE rather than FPC ? My understanding is FPC is just the compiler, Lazarus is the IDE. There might be a better forum section to ask in. I do need Pascal anyway, even if it is only the complier. Okay, I will try to ask this question in another section, but till there would be somebody to help I will stay there. Lets forget about Pascal and focus on a random program. How do I execute it and how can I create a shrtcut on the desktop (dont think I am stupid, but this question is really difficult for Winman, because in Win we have a choice between to create shortcut or not to create)? from project pages is the exception not the rule. Installers are therefore not necessary in the general case. Please use "Synaptic" or "Add/remove software" to search for Lazarus and to install it. You should neither run nor install software in random places but let package management handle it all for you. The thing is that I have no problem with installing or downloading packages. I have a problem where to find this programs and how to execute it. In other articles the people does see this programs in the menu after downloading and unpacking. I checked via "Add/remove software" utility that Pascal is already installed (because I did it using the command line). But how can I find Pascal and its shortcut on my computer? Use the which programnamegoeshere command to find things that or on your PATH. installing Lazarus via package management will add a shortcut to the "Start" menu. What nobody is going to tell how to run Free Pascal? Followed by a ton of useful help. You may well need to add some options to that command depending on what you want to do. See the help messages. fpc is a command line program so you won't see it show up as an icon or menu item in a GUI. If you have the Lazarus IDE installed I presume that is in a menu or icon some place. Sorry I have no idea. I never use Lazarus. If we forget pascal for a moment and think of a random program, as you suggest, then the same applies. If it is a command line program and is installed the normal way you will need to open a terminal and type the command name. It will not show up any GUI. I think that's the gist of the problem. That OP is a "I like GUIs" kinda guy, and all the responders are, as is always the case on boards like this, "I spit on GUIs" guys. In the real world (away from Unix/Linux), people expect a click-something-and-go interface, and they consider the GUI to the *BE* the program. I.e., when normal people think of running the Visual Basic program, they really, really mean clicking on some icon on their desktop and it brings them into Visual Basic. That that icon might actually be labeled something like "Visual Studio" is irrelevant. The Free Pascal Compiler is a pure command line program. Thats why Heater gently explained how to run it from the command line. I'm not sure about that. The OP specifically asked about running fpc. Which s a command line program. A question I tried to answer as best I could. Then about other "random" program. It's not so clear if GUI is an important part of the question. I don't spit on GUI's. I use them all the time. Sometimes they are even useful in software development. Like when laying out forms in a GUI application, but who does that anymore? I do like being able to build a program without all all the complexity of an IDE. No... even Microsoft came to its senses and put a BASH shell into Windows 10. Thus making it a tolerably useable operating system. From the link that the OP posted it seems that he wants the FreePascal IDE, not Lazarus. In a shell he needs to type fp (not fpc). This starts the IDE which is similar to the original Turbo pascal IDE. As previously stated fpc starts the command line compiler. I disagree. No matter whether one likes GUIs or not it doesn't alter the fact that installing a command line only tool won't provide a link, icon, menu option or shortcut to launch something which has not been installed. The main problem is the OP appears to have believed that installing FPC should have installed an IDE. My understanding is it doesn't. That's a separate installation. Wow! THAT brought back memories!! 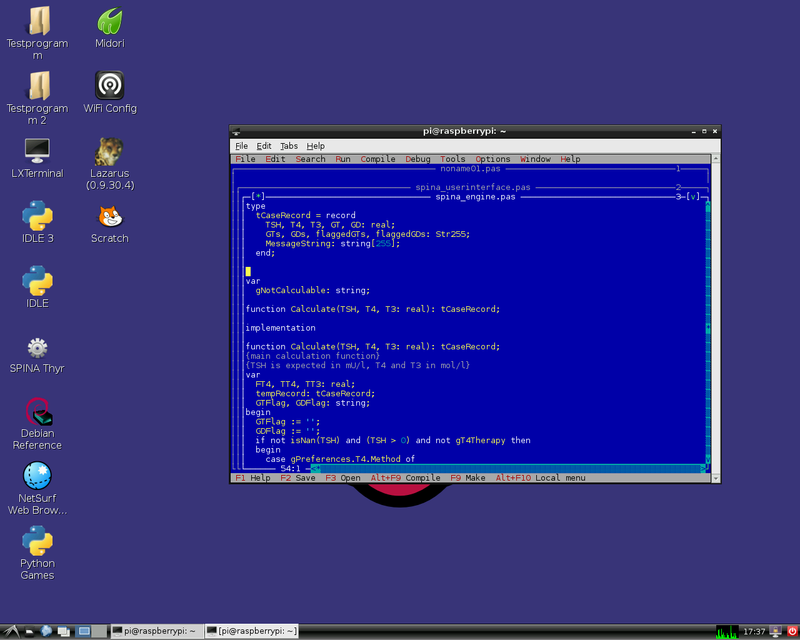 I am a long-time fan of Pascal... going back to the days of Turbo Pascal in the early 1990s... late 1980s? Anyway.... I hope the following will shed light on the discussion above. Most of what I'm going to say was mentioned at some point, but I hope the following will pull things together. a) Once upon a time, "Pascal" was invented. This was before ANYONE had GUIs to like or loath, depending on your point of view. b) A very successful early Pascal was Turbo Pascal from what was then called Borland. Once you've done that, look in the @Programming" part of the Raspbian main menu. You should see an entry for Lazarus. Click on that to start the Lazarus IDE (Integrated Development Environment). If you mean "the thing I use to write programs to run in the Raspbian QUI environment", then that's how. That will create a Raspbian friendly program. You merely drill down to it with the File Manager, and double click, and the program you wrote fires up. "Underneath" Lazarus is the Free Pascal Compiler system. If you don't WANT to-run-in-the-GUI programs, you go into the CLI, and type fp (not fpc). That starts what prompted my comment about memories. That starts a program which will let you write things which will run in the CLI. Rather crude things! But they may be what you want! It is sort of GUI like, in that you have menus, etc. But MUCH more basic. We'll get to "how to start something created this way" in a moment. First I want to point out that Lazarus is MUCH MORE than just a "pretty face" for the underlying Pascal compiler. Lazarus has some amazing things which make it painless to create buttons on forms, have events handled, etc, etc. It really is the place to put your energies in 2018. In the CLI, after doing the installs suggested, enter fp. Use File/New from Template/ Program to start a new app. Enter MyFirstPascal ihn answer to the "Fill in template parameter: Program" request. ... Oh heck. Got this far, couldn't get the little app to compile. "Error while linking". But for LAZARUS, my system works fine. ANYWAY... if you can overcome the "Error while linking", you can create little things to run under the CLI. If you do, I believe that the compiler will create executables... so you'd just type their name at the command prompt to launch them. Or, as I recall... it was a long time ago... fpc myprogram.pas to re-compile the soucecode... not something you'd normally do. If someone can guide me past the "Can't link", I'd be grateful. It would be fun to write a program or two "the old way", for old time's sake!